Grandad science and grandmother math received a special Thanksgiving email treat. 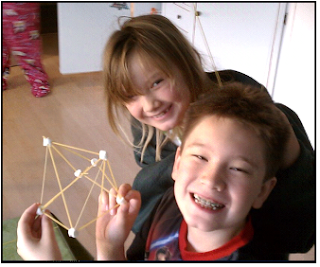 It’s the above picture of our two oldest grand kids, Joshua and Jordann, with a geometric model they made by sticking pieces of uncooked spaghetti into small marshmallows. During a visit earlier this year, we had made geometric models using toothpicks and raisins that they dipped into a soapy solution to see the surprising shapes formed on the models by the interacting soap films (see the April 2010 post). It’s heartening to know they remember how to make the models! Wishing everyone a warm and happy Thanksgiving with family and friends.